The 52mm Center Pinch Snap-On Lens Cap from Sensei is a front lens cap with a squeeze, spring, and snap-on mechanism. It is easy to put on and take off, especially when using a lens hood, and it stays on. Lens caps protect your lens from scratches, fingerprints, and the elements when the lens is not in use. It's always good to have a spare in your camera bag, too. 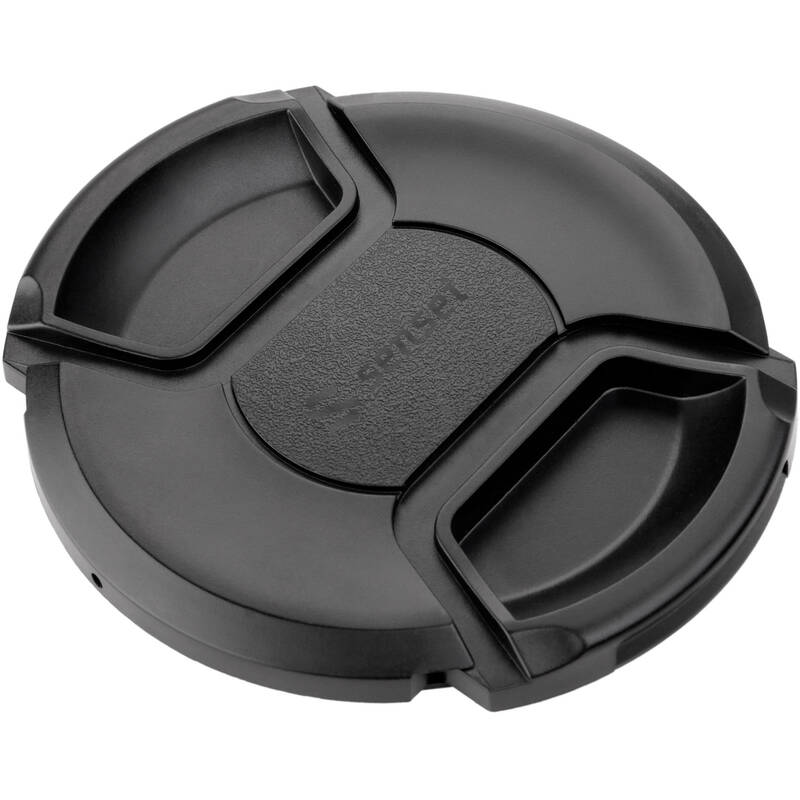 Box Dimensions (LxWxH) 6.5 x 4.5 x 0.3"
52mm Center Pinch Snap-On Lens Cap is rated 4.8 out of 5 by 151. Rated 5 out of 5 by Charles from Better than the Olympus OEM version The original cap kept falling off my Olympus OMD EM5. Just brushing the lens opening against things caused it to fall off. Then the Olympus logo plate fell off. Finally, after losing and retrieving the original too many times it became a geocache somewhere in the woods. For a mere $4 including shipping, this beefier pinch cap stays put 5x as well. I have lost one of these caps already, but that is because it slides in and out of my pocket with my iPhone -not the fault of the cap. And when I do lose one of these, I am not worried. The $4 replacement cost is a great price for a cap that stays put! ...except in my pocket. Rated 5 out of 5 by Jrandyl from Excellent replacement for the Canon Lens Cap Lost the 52 mm dia lens cap that came with my Canon 50 mm f1.8. The Sensei 52 mm dia cap was less expensive than the Canon model, came with free shipping, and was recommended by the B&H customer rep as being well made. When it came, I put it on the lens, the fit is snug, and is easy to put on and take off. Can't say anything negative about this cap! Rated 5 out of 5 by 60mm from Better than the Nikon caps More durable and the pinching mechanism feels better than the Nikon ones. Great product at a super low price. Rated 3 out of 5 by Lucy from OK OK lens cap but it sticks a little and it sometimes takes more than one try to fasten it to the lens. Rated 4 out of 5 by Mtn Dreamer from Nice cap, great price! I own a Canon PowerShot S5IS and upon attaching a lens adapter realized that the original Canon cap did not fit the now 52mm attachment, so I purchase this one. It has a nice snug fit and I love the easy to use center pinch design. Fits perfectly on any 52mm filter also. My only disappointment is that it is lacking a notch for a cap keeper cord, so it gets annoying having to tuck the cap back into my camera bag or pocket every time I take it off of the camera. Would be so much simpler to just let it dangle. Rated 5 out of 5 by JimLoomis from Great Service Supports Great Products When you buy something that costs hundreds of dollars, you expect to get a good product and good service. That's what happened when I bought my Pentax K-x from B&H ... everything went like clockwork. I got good advice, great service and, two years later, I still love my camera. But the real test is what kind of service you get with a piddling little order ... a replacement lens cap. Guess what? Good advice and great service! A big mahalo and aloha from Hawaii from a B&H customer for life. Rated 5 out of 5 by Victor from Works great and a great value. I bought this lens cap to replace the poorly-designed Fuji cap that came with my XF 35mm 1.4 lens. Unlike most non-OEM caps, this is a quality piece of plastic that's easy to use and stays securely on the lens. In fact, it looks like a copy of my Nikon lens caps but without the logo and a non-glossy finish. Unless having the manufacturer's name on the cap is important to you (and there's nothing wrong with that if you don't mind paying more), these are the replacement caps you should get. Does it fit a Nikon Coolpix B700? The Nikon LC-CP29 Lens Cap is the correct lens cap for the Nikon B700. https://bhpho.to/2qwd84jThe Sensei 52mm lens cap may fit, but may not be as secure as the Nikon option. Does it fit on a Nikon Coolpix B700? Check your lens for diameter marking, and cross-check with metric rule (inside) measurement; BTW- mine was for 52 mm Pentax, work great! Does the 52mm cap fit over sensei step up ring 43-52mm? Not sure about Sensei products but a 52mm squeeze-together lens cap fits within the step-up ring part of my Vello ring/hood (Vello LFH-X10 which fit my X20 and now my X30). Also, you can put a 40.5mm squeeze-together cap directly on the lens thread (i.e., no step-up ring and/or hood) but you may wish to grind away part of the internal moving bits of the cap to ensure clearing the front lens element. As you probably know, the step-up ring/hood won't fit inside the LC-X30 leather case while the 40.55mm cap will. And it's more secure on the camera than Fuji's push-on cap. does it fit panasonic lumix dmc fz70? I don't have a Lumix. I have a Nikon. Sorry I couldn't help.